So… you’re considering trying out the keto diet to lose those few extra pounds, but you have some questions. I’m here to help you answer these questions and get you on the ketosis-train! But first – let’s talk about what exactly ketosis actually is – and why you want to get into ketosis. Why Does It Take Some People Longer To Get Into Ketosis? What You Can Expect Going Forward? Ketosis is a metabolic process. It describes the state where your body converts fat stores into energy and releasing ketones in the process. Under ‘normal’ circumstances (i.e. when you are not following a keto diet), your body’s cells use glucose as their primary form of energy. Your body breaks down carbohydrates into simple sugars. The glucose then is used with to fuel your body, or it is stored in the liver and muscles as glycogen. When there is not enough glucose to meet the energy demands of your body, then your body switches to an alternative source of fuel. It will break down your fat stores, in order to provide glucose from triglycerides. Ketones are the byproduct of this process. It can take anywhere from 1 to 10 days to get into ketosis. The keto diet isn’t like other diets where you can be a bit flexible, or have a ‘bad day’ and then jump back to following the diet and eating healthily. It this takes being all in. You cannot do the Keto diet halfway, having a little sugar here and there, and expect your body to reach – or even stay – in ketosis. If sugar is present, your body will always burn that first. By following a keto diet, you are training your body to burn fat instead. It is impossible to determine exactly how long it will take for your body to get into ketosis. It is dependent on different variables such as your body’s metabolism if you are taking supplements or fasting, and your nutrition prior to getting into ketosis. If you were very healthy start with, and largely avoided sugar and processed carbohydrates, your body will make the switch that much quicker than if your previous diet was very unhealthy and full of processed foods and sugar. 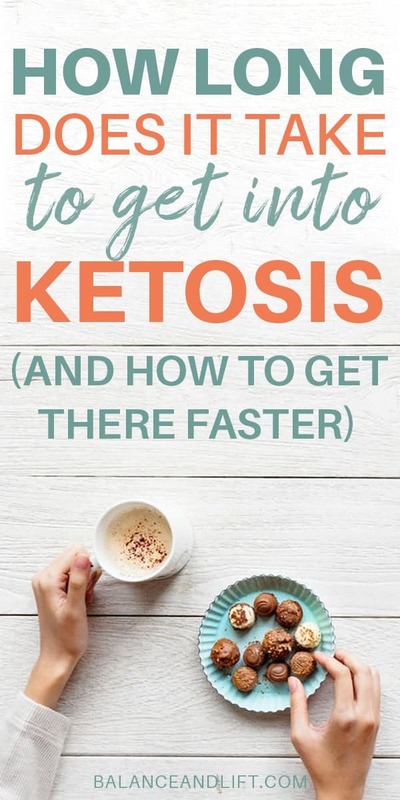 While it is not possible to tell exactly how long it will take for you to reach ketosis, there are steps you can take in order to reach ketosis faster. Each person will take a slightly different amount of time to get into ketosis, even if they are at the same level of health and following the same steps. This is because everyone has a unique metabolism. Insulin resistance affects how you metabolize glucose, and metabolizing glucose is an important element of ketosis. So, if you are following all the steps necessary to get into ketosis, but it is taking a little longer than you thought – try not to stress. It just may be that your body needs a bit more time to get into ketosis. Even though your journey to ketosis is unique due to your own unique metabolism, there are ways to speed up the process. Did you know, it is possible to get into mild ketosis within 12 hours?! But at this point, you won’t yet feel any benefits. To get into full ketosis, where your ketone levels reach 1.5-3 mmol/L, it will take often between 3 and 10 days. 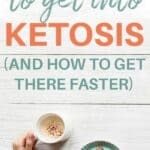 So, if you are feeling impatient, or want to bypass the potential keto flu side-effects of getting into ketosis, you can take a few extra steps so you can get into ketosis fast. Restrict your carbs to 5% of your overall calories, and keep your protein at 25% max. Your carbohydrates should be coming from green leafy vegetables, and cruciferous vegetables, and should be no more than 20g per day. Increase your healthy fats – and get them from a variety of sources. Skip the milk and add heavy cream to your coffee. Add avocado to your leafy green salad, serve with a fatty cut of meat, and drizzle the salad with extra virgin olive oil, for example. Working out will speed up the process of getting into ketosis. This is because you will be burning up glucose much faster. Combine the above tips of keeping carbs below 5% and increasing your healthy fats, with exercise, and you will find yourself reaching ketosis quicker. Fasting and keto often go together hand-in-hand. Now, when I talk about fasting, I am referring to “intermittent fasting”. I’m not saying you must go a few days without any food! If the idea of fasting intimidates you – it might help to know that many people go into a mild state of ketosis just between dinner and breakfast! You can start small by finishing your dinner a little earlier – say, 5 pm or 6 pm – and then not eating anything (or drinking anything other than water) until breakfast. If you are going to incorporate intermittent fasting into your diet, then it is very important to make sure that you stay well hydrated, and drink more water than you would normally. The most accurate way to tell you are in ketosis is by testing – which I will discuss below. But – the tests can range from cheap to quite expensive. Luckily, there are other ways to tell when you are in ketosis, through the side effects that ketosis brings. Ok – I didn’t say these were all going to be good side effects! Many people – once they reach full ketosis – often report having bad breath. The breath has a fruity smell to it. This is very common for people on the keto diet, and other diets such as Atkins. It is caused by elevated ketone levels. The specific ketone that is causing the smell is acetone – this is a ketone that exits your body through urine and breath. Now we’re getting to a good side effect! Significant weight loss can occur in the first week of following a keto diet. It is primarily water weight and stored carbs that are being used up, as opposed to fat loss. Weight loss on its own isn’t a sign of ketosis, but combined with some of the other symptoms on this list means you are likely in ketosis. It is not yet known exactly why being in ketosis causes a reduction in appetite, but it is thought that it may be due to the increase in protein and vegetables. The reasons are still being investigated, but it could also be alterations to your body's hunger hormones, and the ketones may even be affecting your brain to reduce your appetite. While transitioning into ketosis, you will most likely experience some of the very common side effects of the keto flu – brain fog, tiredness, and feeling sick. Learn more about the keto flu and how to avoid it in the linked post! However, once you make it through and reach ketosis, you will feel more energized, focus, and have more clarity. Test strips test your ketone levels through your urine. They are very easy to use and by far the most affordable. My favorite ketone test strips are the Perfect Keto Test Strips. This works similar to how diabetics test their blood glucose levels – you prick your finger, put a drop of blood on the testing strip, and put the strip in the blood meter. This is the most reliable way of testing the ketones in your body. However – the strips can be quite expensive. 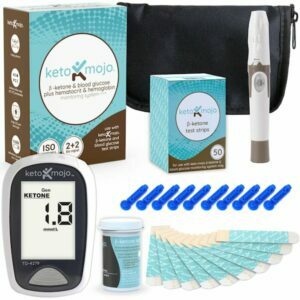 The Blood Ketone Meter I use is the Keto Mojo brand meter. I love it and recommend it to everyone. With a breath testing device, the levels of acetone are measured. It is not entirely accurate on its own, so some people use it in conjunction with a blood meter or urine test strips. I don't personally have experience with this method but I've heard of a lot of people using a breath tester successfully. I hope this helps and you slide easily into ketosis. I know that struggling to reach those magic levels can be a pain, but with due diligence you can definitely get there. After a while of being in ketosis your body can more easily slide in and out of ketosis if you happen to eat a bit of extra carbs one day. So this strict time isn't forever. Don't forget to pin this post for later!! Previous Post: « Vegan Keto: Can You Be Vegan and Eat Keto?